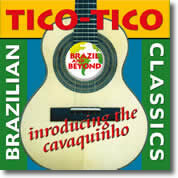 “Our attraction to the compelling Brazilian choro style and our quest for an authentic Brazilian sound took us in directions that are different from what we have done on our previous CDs,” says Rich K.
Cavaquinho: This is the soprano member of the guitar family that originated in Portugal. As a symbol of Brazilian musicality, the cavaquinho is vital to the Brazilian sound. Pandeiro: Of Arab and Oriental origin, the pandeiro was originally played only with beats of the hand to mark time or as an accompaniment to the dance. In Europe it came to be utilized in operas, such as Preciosa by Weber. In Brazil it became popular in the hands of João da Baina in the orchestrations of Pixinguinha. 7-String Guitar: Probably of Russian origin, the 7-string guitar is nothing more than the 6-string guitar with the addition of a bass string. It’s the seventh string that increases the range of the instrument forthe phrasing of the bass line as counterpoint to the melody solo. No one before Azevedo had shown the musical possibilities of the instrument. Possessing a superior sonority, he played with a free right hand in a manner that enabled him to produce a great volume of sound from the cavaquinho. He used the higher register for virtuosic displays. As a composer, he had the gift to create simple themes and be highly communicative. “The Little Brazilian” (Brasileirinho): The resounding melody of “The Little Brazilian,” whose first part is played practically on one string, was made even more memorable because of Azevedo’s cavaquinho virtuosity on the original recording. “Delicate” (Delicado): Released in December 1950, “Delicate” was another thundering success following “The Little Brazilian.” Originally a bolero, the composition had its rhythm modified to a baião. It led the hit parade of 1951 and was one of the best-selling discs in Brazil in the era of the 78 RPM. Recorded by Percy Faith and his orchestra, it charted on the Top Ten in the United States. “Flower of the Pastures” (Flor do Cerrado): What’s distinctive about this flower is that it is in great demand by tourists as a souvenir from Rio de Janeiro, Brazil’s capital city. Azevedo wrote it on September 20, 1977, during his flight from São Paul en route to the session at which it was played for the first time and recorded for the pleasure of his many fans and followers. “The Mouse” (Camundongo): This is one of Azevedo’s most technically demanding but melodic showpieces for the cavaquinho. “Contrast” (Contraste): This slow choro in two distinct sections was first recorded in 1977 on the same LP with “Flower of the Pastures.” Often mistaken for an Italian folk song, the melody is spellbinding. Abreu was far from being a talented instrumentalist like his countryman Azevedo, but he nonetheless was gifted in the art of composition. Many of his melodies became true jewels of success. “Tico-Tico” (Tico-Tico no Fubá. Translation: “Crown sparrow in the cornmeal”; hear clip): The most famous of Abreu's compositions, “Tico-Tico,” first appeared at a dance in his hometown. When the dancers heard the opening notes of his melody, they gyrated so much that the instrumental choro earned the name of “Tico-Tico no Farelo.” Much later it was renamed “Tico-Tico no Fubá” and was given lyrics by Eurico Unidos. It was introduced in the United States by Carmen Miranda in the 1947 film Copacabana. Jobim was an architect of the bossa nova along with lyricist Vinicius de Moraes and guitarist-vocalist João Gilberto. The bossa nova originated in the late 1950s in Brazil and had reached international status by the mid-1960s. “The Girl From Ipanema” (Garota de Ipanema) (hear clip): Reaching the top of the U.S. charts in 1964, this Jobim-Moraes collaboration epitomizes the cool, seductive sound of the bossa nova. Bonfá foreshadowed the bossa nova style and was an important influence on the guitarists of his day. He played a critical role in the evolution of Brazilian guitar playing. Nazareth was, without a doubt, the composer who did the most to consolidate the piano in Brazilian popular music. At an early age he absorbed European piano culture, especially the works of Frederic Chopin, which would form the basis of his pianistic and compositional technique. Through the legacy of the pioneering choro composers of the 19th century and of the Afro-Brazilian tradition, Pixinguinha produced the most important choro works of all time. Edifying the choro as a musical genre, he conferred on it personality and identity. “Affectionate” (Carinhoso): In a nationwide vote organized by Brazilian TV Rede Globo in 2000, “Carinhoso” was the choro-song selected as the second-most beautiful Brazilian composition. Composed in 1924, the piece was tucked safely away in a corner of Pixinguinha’s bookcase for several years because he knew its two-part melody was regarded very modern for the time. When “Carinhoso” was finally recorded in 1928, he was not surprised that it received negative reviews accusing him of “jazzification.” It was not until Branguinho wrote lyrics for the melody and Orlando Silva, the most famous singer of the time, recorded it in 1937 that the song achieved popular success. This prolific composer, radio personality, sports announcer, actor, humorist, commentator and TV star is credited with more than 300 compositions in the style of carnaval marches and samba-cancão. “Brazil” (Aquarela do Brasil) (hear clip): This composition received international exposure in the 1940s when it was included in the 1942 Walt Disney film Saudos Amigos. In a nationwide poll of Brazilians in 2000 conducted by Rede Globo TV Brasil, it was chosen as the most beautiful Brazilian song.